AAUA Postgraduate form 2018/2019 is out. 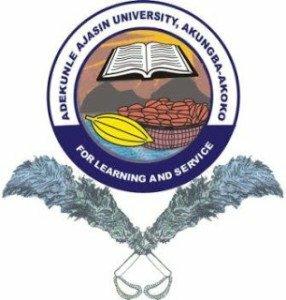 Adekunle Ajasin University, Akungba-Akoko, AAUA postgraduate (part-time and full-time) admission application forms for the 2018/2019 academic session are out on sale. Interested members of the public are hereby informed. The University Management has approved that the University Portal which was closed on 28th December, 2018 for purposes of the Postgraduate admission exercise for 2018/2019 be reopened with effect from Tuesday, 8th January, 2019 to Monday, 25th February, 2019. All interested candidates into the Postgraduate Programme of Ambrose Alli University are hereby advised to seize this magnanimous window of opportunity to apply for the Postgraduate Progamme. The Postgraduate School of Adekunle Ajasin University, Akungba-Akoko, is inviting applications from interested and suitably qualified candidates for admission into our Full-Time/Sandwich Postgraduate Master/Ph.D. Programmes as indicated below for the 2018/2019 academic session. Applications are invited for admission into the following AAUA Postgraduate Diploma, Master and Doctor of Philosophy courses/programmes listed. Click here for List of AAUA Postgraduate Courses Available. AAUA Postgraduate Diploma Degree Programmes are open to both full-time and part-time students. All AAUA Master’s degree programmes take a minimum of a year and half (three Semesters) and a maximum of three years (Six Semesters) for full-time candidates, and a minimum of two years (four Semesters) and a maximum of four years (eight Semesters) for Sandwich candidates. The AAUA Doctor of Philosophy degree programme takes a minimum of three years (six semesters) and a maximum of five years (ten semesters) for full-time candidates, and a minimum of four years (eight Semesters) and maximum of six years (twelve Semesters) for M.Sc & Ph.D Sandwich candidates. Candidates are required to pay through Remita Platform only at the following Banks: Access, Skye, Wema, First, Zenith or Keystone and Heritage etc, for a sum of Ten Thousand Naira (N10,000.00) and log on to our website at www.pgs.aaua.edu.ng to complete the application form, submit and print a copy to be able to sit for the qualifying examination at a date to be announced later. Application for AAUA Postgraduate programme for 2018/2019 academic session shall close after four (4) weeks from the date of this publication.